In the UK a poppy is worn in the run up to 11th November as a sign of remembrance for those who have lost their lives fighting for their country. The hostilities of World War I officially ended at the 11th hour of the the 11th day of the 11th month in 1918. Paper poppies are made and distributed for donations by The Royal British Legion with the funds going to support families of the Armed Forces, whether veterans or those on active service. Services of remembrance are held on the nearest Sunday and a minutes silence will be observed by some on 11th at 11.00am. The poppy is a prominent symbol of remembrance throughout the Commonwealth and was chosen due to the large numbers of the flowers that appeared in the battlefields and graveyards of Northern France after the First World War. Poppy seeds will lie dormant in the soil for many years, germinating once the soil is disturbed. They are mentioned in the poem In Flanders Fields by Lieutenant Colonel John McCrae and were first suggested in 1918, adopted by the American Legion in 1920 and the British Legion's first Poppy Appeal was in 1921. In France there is no poppy appeal, but the 11th November is a public holiday. 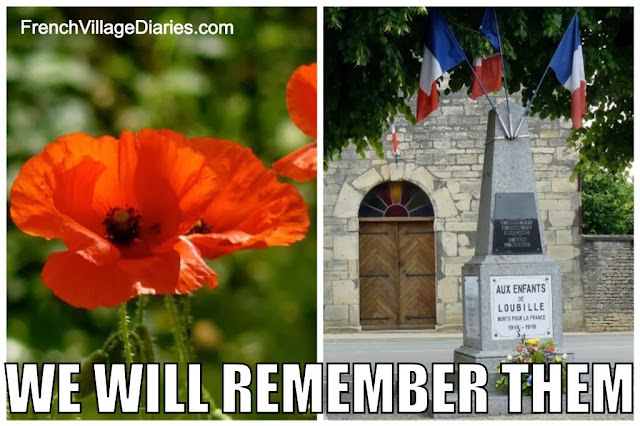 Every town and village has a memorial to it's 'children' who lost their lives 'mort pour la France'. Flags and flowers will be displayed and ceremonies of remembrance will be held in the morning of 11th by the local Maires. A vin d'honneur will be served in our village and probably in many others as well. Our French neighbours are pleased that we join them for their remembrance ceremony and have grown used to seeing us wearing our poppies with pride. Our two countries may well have different traditions and ways of remembering this shared date, but the important thing is that we all, young and old, remember. How do you remember this important date?